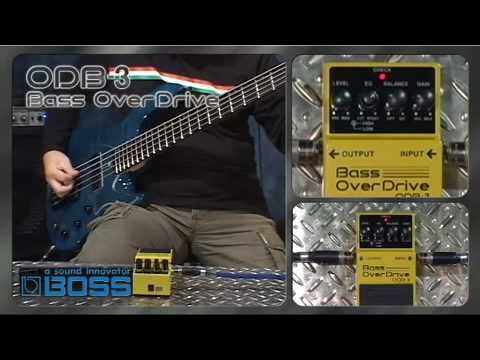 Designed specifically for the bass guitar the Boss ODB-3 Overdrive Bass Pedal gives you all the options you could need. Covering the basses entire frequency range, including 5-strings, you can get the overdrive sound you want for rock, thrash, and punk. With the original overdrive sound that was created by pumping up the gain on a tube amp the Boss ODB3 Overdrive Bass Pedal alters naturally with your sound; giving you warm, clear overtones when playing quietly to full harsh, distorted overdrive at higher volumes. Furthermore the Boss Overdrive ODB-3 Bass Pedal gives you more control than most of the overdrive effects pedals out there. Great importance has put on the sound coming from your bass with a Balance control to let you dial in just the right amount of overdrive without compromising your dry sound. The Boss Overdrive ODB3 Bass Pedal also has a 2-band EQ to shape your tone by allowing you to cut and boost frequencies. Along with the Level and Gain knobs it is these controls that make this pedal stand out; cultivating your specific sound, for example blending the distortion with the dry sound in equal ratio will give you the perfect thick, wild sound that will enhance slap bass playing or just throw everything to the right for full-on throaty roar. It is with good reason that Boss has been around for so long and has become THE effects pedal manufacturer. Aside from the awesomeness they bring to your sound the pedals are built to withstand life on the road with their robust aluminium die cast bodies and sturdy control knobs. They are also lightweight and compact so carrying them from gig to gig is easy as well. Ever faithful in their products Boss offer a 5-year warranty with the Boss ODB3 Overdrive Bass Pedal when you register it with them.